To organize your patio for either purpose like for dinner, breakfast or just for coffee taking or sitting, it only requires a couple of benches or sofas and a table to be at the center! You just no need to buy any of these things from market as the higher industrial prices can make you escaped from there! 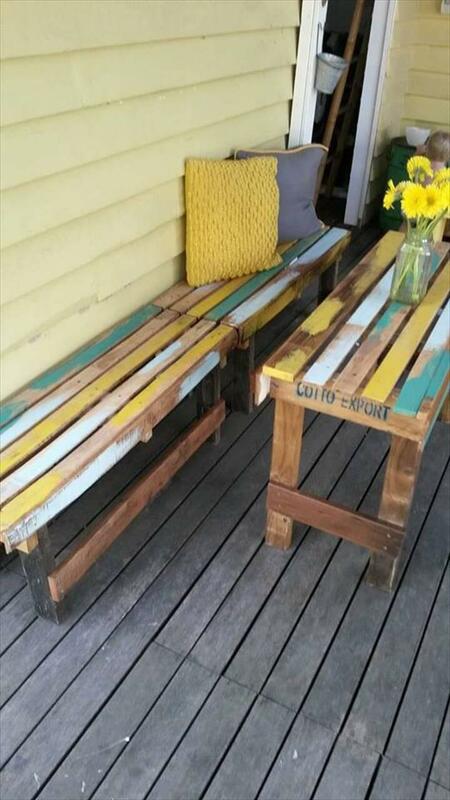 Release you genius imaginations and repurpose the pallet to install some highly stable and sophisticated benches and tables to style up your patio! This set of furniture containing a pallet wood table and two benches to be around the table, is just perfect to plan any outdoor area for picnic, dining or breakfast and would be a lovely platform to enjoy outdoor gossips with some closed friends! The painted sides of pallets have been turned into table tops and comfortable berth sections while the sides have been resized and refinished to give the heavy duty legs to both table and benches! 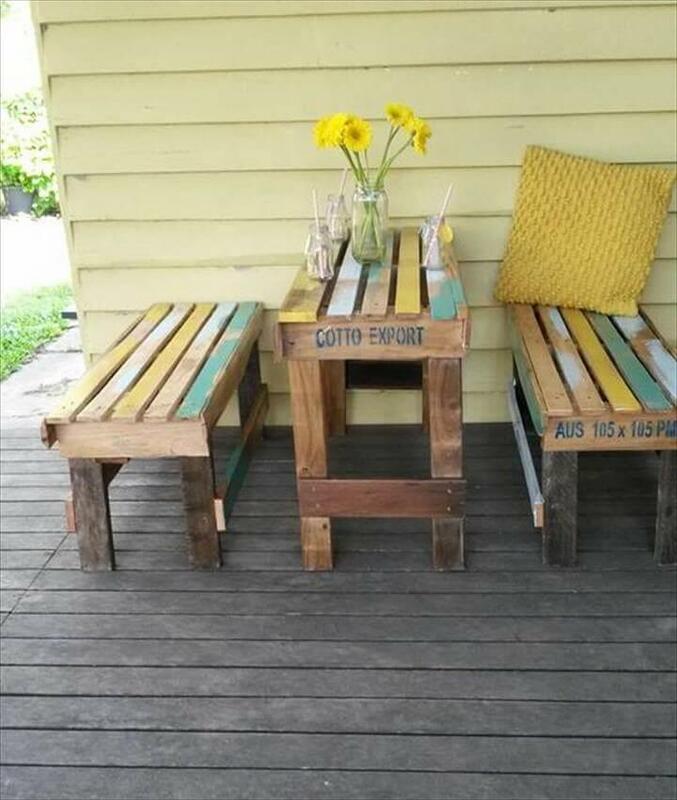 This DIY pallet patio furniture set required nothing a bit of your budget but some effort and creative planning! 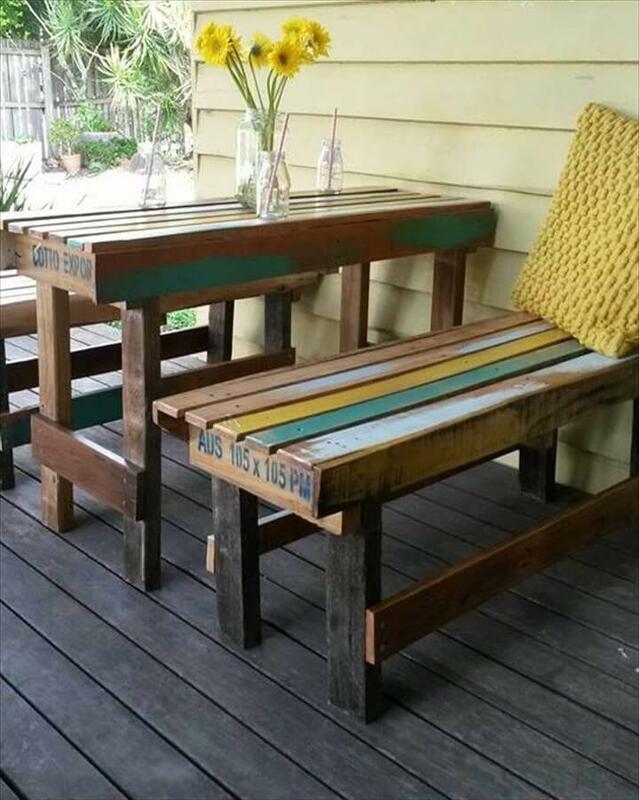 Build a raised pallet table and two benches to be around by doing this you can some mind blowing setups for outdoor dinner and breakfast! Use this furniture set in your home lawn, at patio or in backyard to double up your picnic fun! A little bit paint has been used to make both benches and table more showy and old mason jars have been used as table vases or centerpieces! 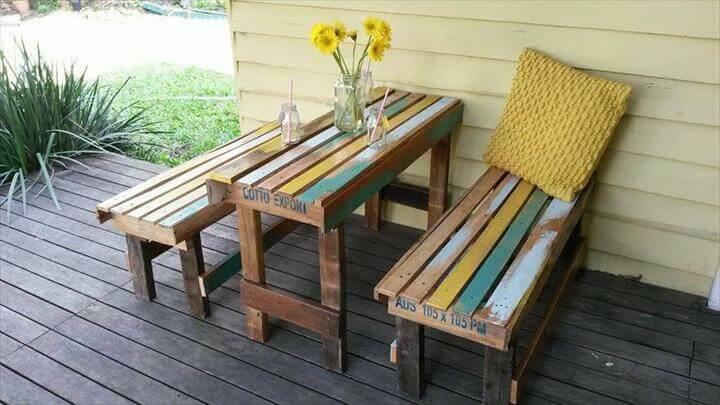 Beautiful DIY pallet project to get adorable furniture for outdoor dinners and breakfast!